Cher made the big mistake of making a pro-American statement Sunday night. The music icon tweeted that she didn’t want more migrants burdening her hometown of Los Angeles, and she mentioned the huge homeless population and said many of them are veterans who should come first. Well, Cher was utterly destroyed by leftists for being pro-American, and that’s when she had a massive meltdown. Don’t miss this. Cher is having a crisis. The 72-year-old is usually praised by Democrats and leftists. She has a long history as a rabid Trump-hater and can be counted on to spread that hate to her 3.6 million Twitter followers. That was until she crossed the line and used her common sense instead of just regurgitating the fake news. You see, Cher didn’t understand how open borders were a good idea, especially for her hometown of Los Angeles. We bet the Oscar winner has traveled around town and witnessed the horrendous situation the homeless veteran population finds themselves in. So, she did the unforgivable sin on the left: she forgot their talking points and broke ranks, thinking for herself. “I Understand Helping struggling Immigrants, but MY CITY (Los Angeles) ISNT TAKING CARE OF ITS OWN. WHAT ABOUT THE 50,000+Citizens WHO LIVE ON THE STREETS. PPL WHO LIVE BELOW POVERTY LINE,& HUNGRY? If My State Can’t Take Care of Its Own(Many Are VETS)How Can it Take Care Of More,” Cher said. And when she started to get flak from the rabid leftists, Cher took it a step further, and in doing so, she had no idea she was advocating President Donald Trump’s policies. The Grammy Award winner then said, “There must be a process. People looking for asylum and qualify must then see a judge.” She went on to explain we can’t have our cities overrun. You can imagine the outrage by Democrats and leftists. Cher is saying we just can’t allow people to come in the United States unvetted. It has to be “legal immigration.” This is the polar opposite of open borders and everything the Democrats are advocating. 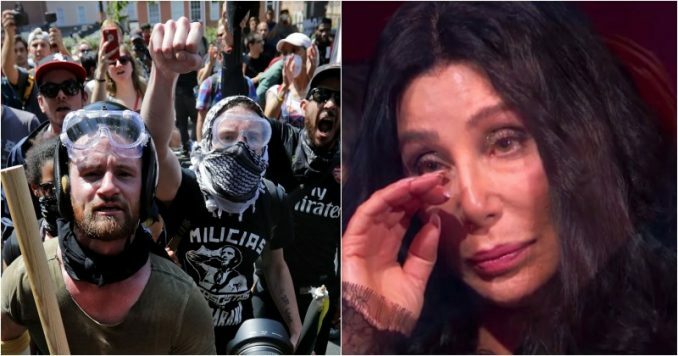 And poor Cher didn’t know what hit her as she was attacked by the leftists. “Sorry, this is an ignorant statement. If that was our rationale, we might as well take down the statue of liberty. We have enough resources & compassion to do both. Pitting Vets & homeless ppl Vs immigrants fleeing from danger is not a good look Cher,” tweeted Rabbi Jill Zimmerman. Sorry, this is an ignorant statement. If that was our rationale, we might as well take down the statue of liberty. We have enough resources & compassion to do both. Pitting Vets & homeless ppl Vs immigrants fleeing from danger is not a good look Cher. That’s just one example of the thousands of responses Cher received, confusing “legal immigrants with illegal aliens.” Many contain four-letter words and ruthless attacks which destroy Cher in every way. And the music icon was so distraught at this reaction. Cher just didn’t understand what had hit her. Well, Trump supporters knew exactly what happened. Cher had used her own brain. She didn’t know that’s not allowed on the left. She broke from her brainwashing and went rogue. “You spoke the truth without a PC filter that why they condemn you. Think about how bad you feel being unduly attacked the next time you attack Republicans & our President. Republicans and Libertarians do not enjoy being insulted unjustly either,” tweeted Laura Hollis-Wood. You spoke the truth without a PC filter that why they condemn you. Think about how bad you feel being unduly attacked the next time you attack republicans & our President. Republicans and Libertarians do not enjoy being insulted unjustly either. “Exactly Cher. That’s what us Trump supporters have been saying for decades. It’s not that difficult to comprehend. Legal immigration is OK. Illegal immigration – not OK. Libs need to stop lecturing us about compassion and focus on economic realities,” tweeted Lyle Haines. The question is will Cher figure out that thinking for herself and using common sense is why she was attacked? Will she be willing to give up the warm celebrity embrace by the leftist Hollywood crowd to stand on her own? The bright lights and admiration and Cher’s long history as a far-leftist might be a bridge too far. It takes guts to be a real American patriot in this country today, and it’s even tougher to admit you were wrong to ever condemn President Donald Trump.